It was a 'Super' Sunday for New York yesterday as The New York Rangers defeated the red-hot Montreal Canadiens 5-3 and the New York Giants delivered one of the greatest upsets in NFL history, humiliating the undefeated New England Patriots 17-14. Both games were terrifying and exciting. Official recap here. Okay, so Chris Drury had nothing to do with the football game, but the kind of press Drury is getting of late suggests that we might finally be seeing a little of the six million bucks the Rangers are footing this season for the renowned 'Clutch-man'. 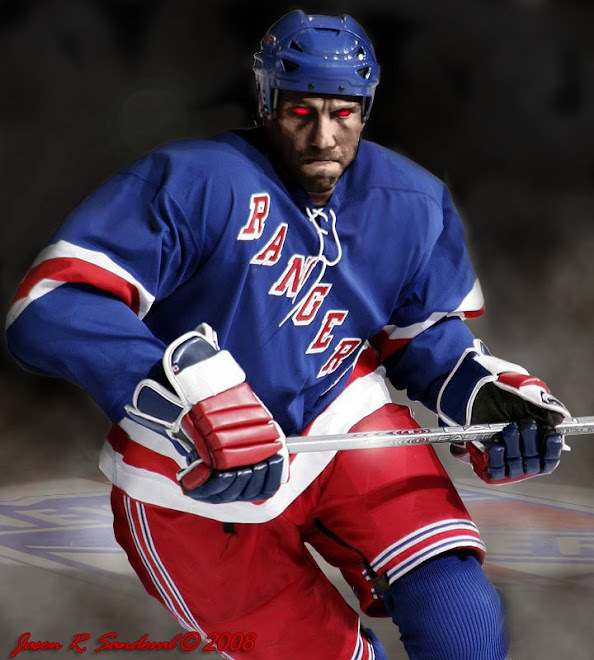 The Dark Ranger has received numerous emails criticizing my position that Drury is an "asset about to come alive" -- and I steadfastly maintain that this guy is going to contribute to the Rangers rebound this spring. My position is not a 'love-fest' (as one email suggested), it is just taking a position on someone I think will help to turn the team around. Jagr hasn't done it. Shanny hasn't done it. 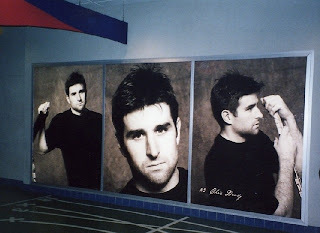 The standouts this season are simply: Brandon Dubinsky, rookies Dan Girardi & Marc Staal, resident instigator Sean Avery (when playing), Henrik Lundqvist (until recently) and now rightfully his turn, Chris Drury. Yesterday when the Rangers were down 0-3 halfway through the second period (and yes, I gave up too! ), Drury, who was 1-1-2 for his third consecutive two-point game, capped the comeback by scoring the eventual game-winning goal at 10:09 of the third period. All in all, and down by three, the Blueshirts led five unanswered goals and stole the game from Montreal. This was the most exciting game of the season - and they earned it. Even our coach has nice things to say. “This guy’s been phenomenal lately. He’s been a great man all year long anyway, but it’s nice to see him get what he deserves and our team get the residuals of that.” — Rangers coach Tom Renney on the recent play of center Chris Drury. Not that Tom Renney is the voice of reason, but he, along with the team, are looking for that someone who is going to step it up and lead by example. Drury is doing that for now. Other outstanding 'kudos' go to Brandon Dubinsky and his level of play. This kid is duping veteran All-Stars, outplaying his fellow players and, despite his inexperience as a rookie, plays with heart and tenacity. In fact, he is all heart and it shows. Sean Avery, once again, demonstrated grit and protecting your team. Fantastic show, folks -- a comeback game like this reminds us to never give up -- never say never. 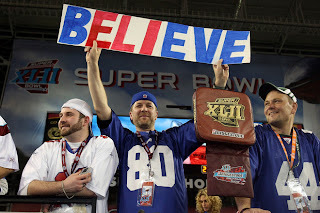 On the football side of things, if we were to look at our 'Super Sunday' yesterday, you have to consider the underdog approach in sports and how the NY Giants were just able to make it into the playoffs and stage the greatest and unexpected of championships. The Giants had the perfect answer for the suddenly imperfect Patriots: a big, bad defense and an improbable comeback. Such could be said of our New York Rangers against Montreal and even larger, our Rangers against the rest of the season. The last three improbable Blueshirts wins puts us six points ahead, only three points from the division leader. In the end, we only need to qualify to get our shot in the playoffs. The NY Rangers are sitting seventh in the conference. Surprised? Stranger things have happened, but it does give The Dark Ranger hope. So hang in there Rangers fans -- this may be the beginning of something very Dark. 1) The MVP should have gone to the entire Giant's defensive line. They made the last minute come back possible! 2) The Rangers are finally(possibly) turning the corner. Looks like a photo copy of last season when an early February win streak seemed to turn the tide and salvage the season. 3) Suddenly the division title(and a 2nd seed) is looking possible! Don't turn the light on yet Dark Ranger, not yet. Possible is the operative word in our little 'phase of comeback'. I am cautiously getting optimistic. Taking LA tonight and Anaheim on Thurday would be enLIGHTening. I'll be at the Philly game on Saturday....cannot wait.